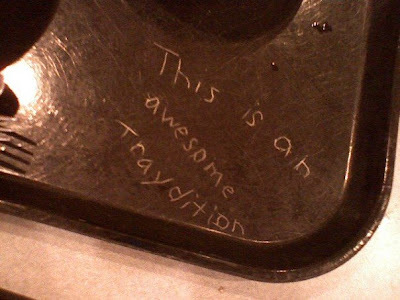 NPR's All Things Considered did a story today about college cafeterias going trayless. Vassar isn't mentioned, but Aramark is. The news correspondent talks about the amount of energy saved by removing trays. Then, one student says (the funniest quote from the program): "It wastes my energy to go back and get everything." hell yeah. mads listens to npr. those fiesta plates weigh approximately 45 pounds each... it's difficult to carry a bowl and a plate out together. then i have to find a seat, put all of my stuff down, and go back for a drink and silverware. also, forget about carrying anything hot for more than 1 minute because you'll burn your damn hand off.